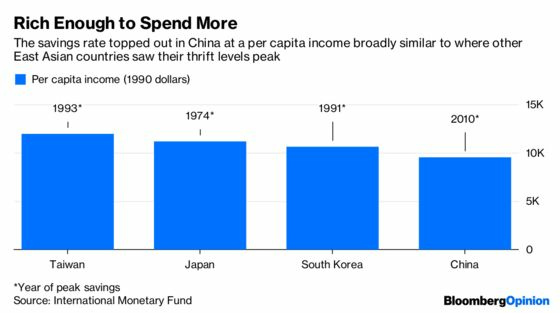 (Bloomberg Opinion) -- Consumerism in post-1978 China has ridden five waves: from finding a solution to food shortages; to owning the “new big three” (refrigerator, color TV and washing machine); spending more on information; buying automobiles; and finally, real estate. All the swells are now spent, according to Renmin University economist Xiang Songzuo. What could be the sixth surge? Using stimulus to reverse the first annual decline in car sales in at least two decades or encouraging households to buy new appliances on credit aren’t lasting solutions. Giving up on private consumption doesn’t make much sense either. Xiang argues that the switch from investment and exports to personal spending and services has thrown up more negatives than positives. That isn’t a valid criticism. 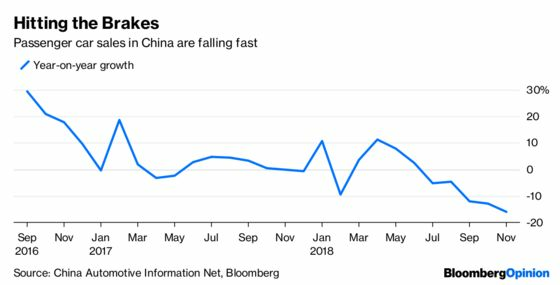 If nothing else, the shift in emphasis has put a lid on external imbalances, which used to show up in the bloated current-account surpluses China ran against the rest of the world. Those are now history. But things won’t be on an even keel internally as long as the Chinese are saving 30 percent of their disposable incomes. Consumption has to rise further in order to curb the supply of surplus funds chasing yield. Only then will the overflow of credit — a major domestic imbalance — start to recede meaningfully. Invoking the East Asian culture of thrift to explain China’s high household savings is unhelpful. The problem isn’t so much that the rich set aside half their incomes, but that even the poorest households squirrel away 20 percent. Elsewhere, the lowest-income families typically spend more than they earn, and taxpayers subsidize the gap. The 30 percent savings rate for the poorest 10 percent is reversible, considering that even at the time of China’s 2001 accession to the World Trade Organization, this group saved only about 5 percent of disposable income. Suppose the People’s Republic spends 200 yuan ($30), spreading it equally between the urban social safety net and rural healthcare. The IMF’s simulations show private spending would rise by 40 yuan in cities and towns, and by 35 yuan in villages. That should help policymakers firm up the agenda, now that they have abandoned the one-child policy. Instead of papering over cracks in growth with short-term stimulus, the goal of fiscal policy should be to redistribute income — away from top earners and surplus-hoarding state owned enterprises and toward low-income families. The next phase of consumerism will be less about the things people spend on and more about who among them will do the heavy lifting. Unlocking the spending power of service-industry workers in smaller cities may well be the sixth wave.